After a month of pasta for dinner*, I find myself craving some serious greens. Vegetables become front and center of my meals, and I find myself effortlessly getting the recommended 5+ servings of fruits and vegetables a day. *I’m exaggerating a little of course, but hey, it was January. I like to call this season February. It’s when you find yourself over winter but there’s still a bit of it to go, and you think maybe eating more fresh foods will bring the spring. It’s about as sensical as it sounds, but my body loves it! The roasted garlic gets blended into an easy caper-miso-tahini dressing for a big blast of salty umami flavor. 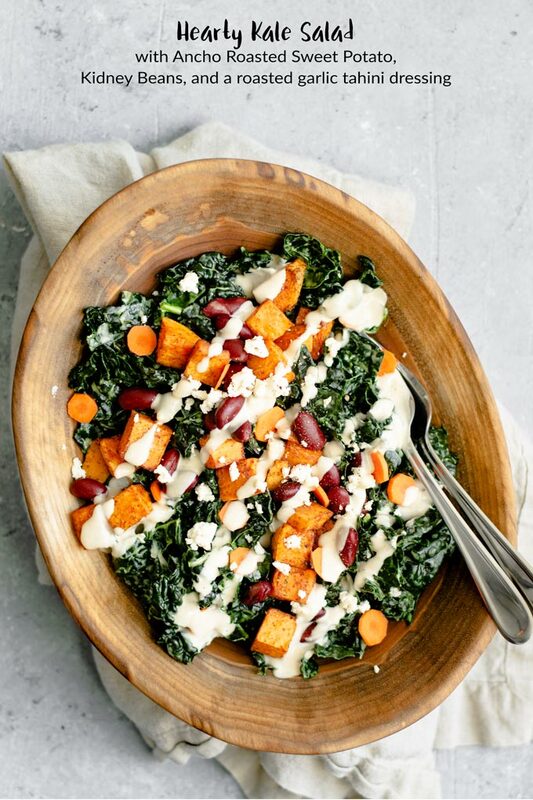 This complements the sweetness of the roasted sweet potato, which in turn complements the earthy kidney beans and mildly bitter kale. All in all, it’s a super easy salad to make, and one that I don’t mind eating huge meal-sized portions of! Though, if you’d rather eat it alongside some baked ziti, well, that’s delicious too! I love tahini dressings because they’re super easy, creamy, flavorful, and satisfying in a way that vinaigrette never will be. It helps salads like these be acceptable (to my belly, anyway) as meals–though a side of sourdough toast never hurts! The garlic gets roasted simultaneous to the sweet potato. Roasting garlic is one of the easiest things to do! Just cut off the top of the bulb of garlic to expose the cloves, remove the extra papery skin around the bulb of garlic, drizzle some olive oil over the garlic, wrap it up in foil, then bake! When fully roasted the cloves will turn buttery soft, sweeten, and their sharp bite turns mild. It’s so soft that it can be spread over bread, or smashed into a dressing! The dressing is made of 7 simple ingredients: tahini, roasted garlic, extra virgin olive oil, miso, capers and the caper brine, and water to thin. Smash the roasted garlic cloves and whisk the ingredients together, or just use an immersion blender. It’s nutty, earthy, garlicky sweet, salty, tangy, almost lemony. A super taste-test worthy dressing, just make sure to leave some for the salad! The dressing does make more than you need for a well dressed salad as written, but it will keep for a week or so, and it’s good drizzled over stews and buddha bowls as well as for making extra salads! Roast the sweet potato: peel it (or just wash it well), cube it, and toss with olive oil, ancho chili powder (or regular chili powder), and salt. Then bake until tender! For me, the biggest part of making a kale salad successful and something you want to eat is massaging the kale. Physically going in with your hands and squeezing the washed and chopped leaves makes them more tender, easier to digest, and more pleasant to eat. When massaged, kale loses volume and turns a vibrant shade of green. You can massage kale either dressed or undressed, but my preference is to drizzle a bit of extra virgin olive oil over top and sprinkle on some salt and black pepper. The oil and salt helps break the greens down, and pepper just tastes good. 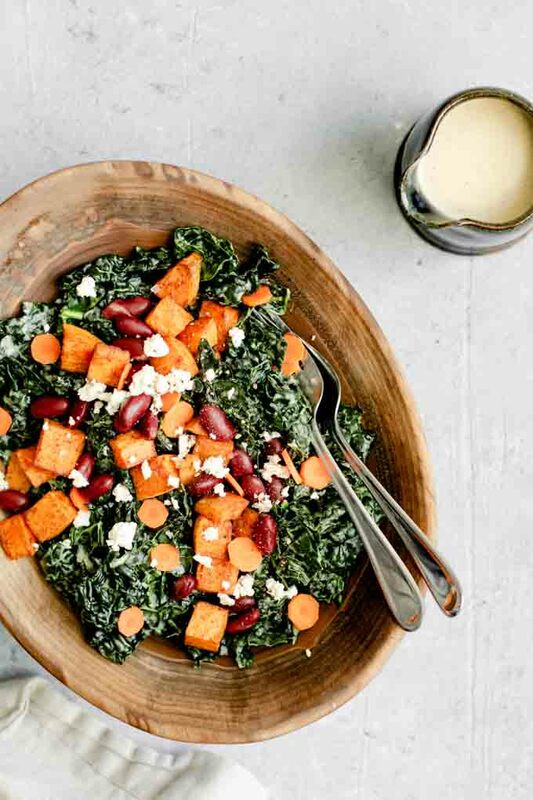 To these massaged greens we add the ancho roasted sweet potato, cooked kidney beans, and thinly sliced carrot medallions. Add dressing to taste and toss to coat. To finish, I like to sprinkle over some crumbled vegan queso fresco. In the winter, I like my salads to have a warm component. The roasted sweet potato is perfect for this! Served right from the oven the sweet potato warms the belly right up. Or, if made in advance you can keep the sweet potato separate and re-warm it before adding to the salad. Kale is the perfect green to dress in advance and to hold up to hot ingredients. It won’t wilt under the heat, and absorbs the dressing a bit, becoming even more tender and delicious to eat. I like adding kidney beans to this salad, though of course any bean would work. Kidney beans are buttery in texture and mild in flavor, and you can’t beat their pretty ruby red color! 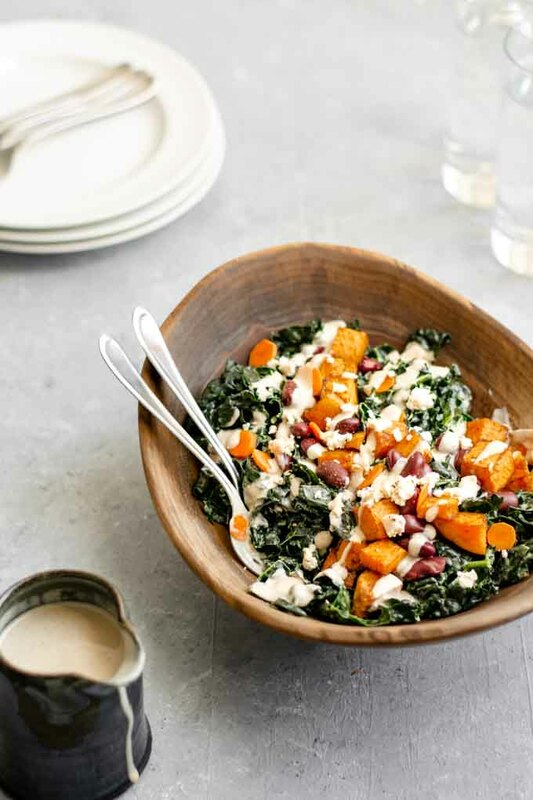 Leaving the beans plain pairs well with the bold flavors of the dressing and the sweetness of the sweet potato. 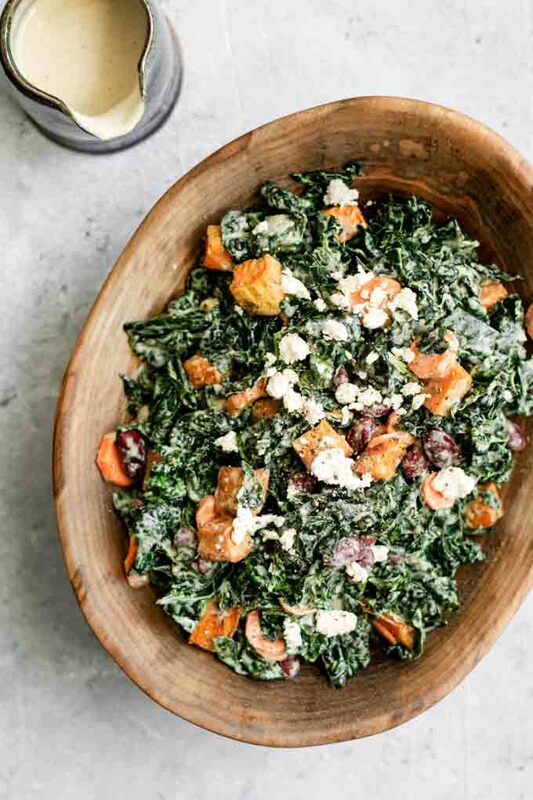 Kale salads are so versatile, and if they’re not already part of your repertoire you should definitely add them! This salad is full of good for you nutrients and enough carbs, proteins, and fats to help keep you full. This recipe makes enough for 4 entree sized servings. Meal prep and eat these servings throughout the week thanks to the hardiness of kale, or serve at once at a family dinner. Feel free to add some chopped nuts or seeds to the salad, or your favorite grain and make it your own! 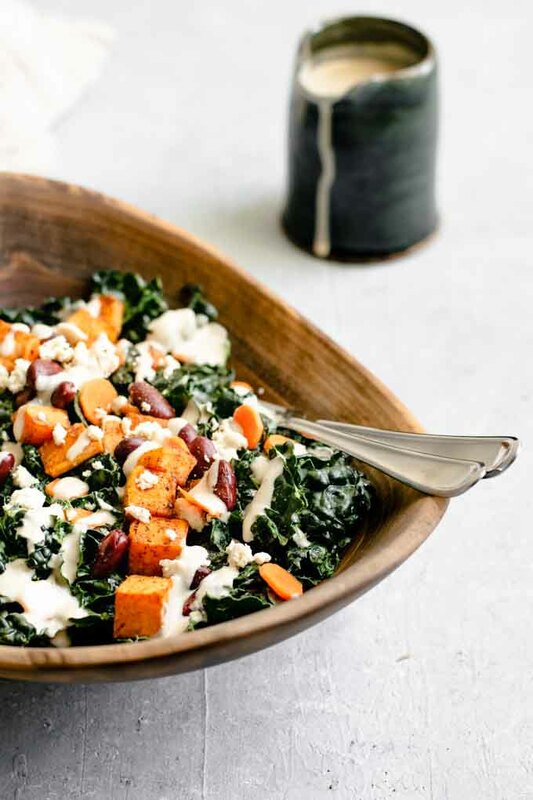 If you make this kale salad with roasted garlic tahini dressing, leave a comment below and rate the recipe on the recipe card. And please share your photos with me on Instagram, tag @thecuriouschickpea and #thecuriouschickpea, I love seeing your creations! Want more delicious vegan recipes? 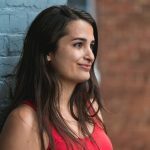 Follow me ON INSTAGRAM, FACEBOOK, AND PINTEREST! 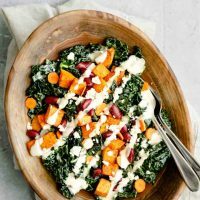 This delicious kale salad, tossed with roasted sweet potatoes, kidney beans, and a roasted garlic tahini dressing makes a hearty meal or nutritious side! Cut off the top of the garlic and remove extra papery skin. Drizzle 1 teaspoon of oil over top and wrap in foil. Bake for about 30 minutes, until the garlic is soft and caramelized. 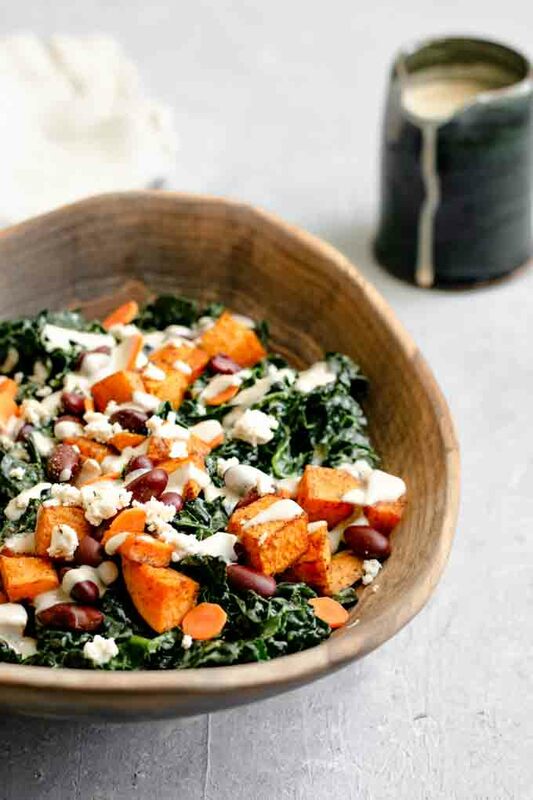 Toss the cut sweet potato in the 2 teaspoons of olive oil, salt, and the ancho chili powder--use 1 teaspoon for a smaller potato and 1 1/2 teaspoons for an extra large one. Roast for 25-30 minutes or until the potato is fork tender. Make the dressing: In a large liquid measuring cup combine all of the ingredients, starting with 1/4 cup of water and either blend with immersion blender or smash the cloves and whisk well. Add more water to thin until desired consistency is reached. In a large bowl add the chopped kale, the olive oil, salt, and some ground black pepper. Massage the kale by hand until it has shrunken in size and turns a vibrant green. Add the roasted sweet potato and kidney beans, toss with the dressing and garnish with the carrots and vegan queso fresco (if using). Add salt and pepper to taste.